This is an album by the duo of Polish Jazz-Rock Fusion veterans: guitarist / composer Krzysztof Puma PiaseckiFind albums by this artist and bassist / keyboardist Jozef SkrzekFind albums by this artist (of SBBFind albums by this artist fame). 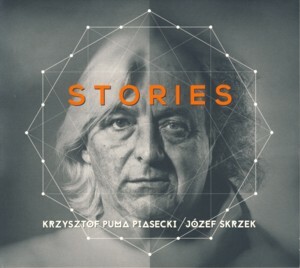 The double CD album presents fifteen original compositions, six by Piasecki, five by Skrzek and four co-composed by Piasecki and Skrzek. The music is a beautiful collection of melodic tunes, which float somewhere between Fusion and Progressive Rock and feature extended improvisations. Piasecki plays a plethora of acoustic and electric guitars and piano on one tune, and Skrzek plays various keyboards and adds wordless vocalese parts. Although not explicitly stated, the music could be easily considered as a concept suite, since the pieces follow in a coherent manner and obviously present a uniform stylistic concept. The music develops slowly and moves from quiet passages to dynamic peaks, as appropriate for Progressive Rock. The sound is however more Fusion oriented due to the guitar sound and mannerisms, resulting in a wonderful Prog / Fusion amalgam. It is heart worming to hear Skrzek performing so well and being so vigilant, especially in view of the fact that his music in the last decade or so seemed to lose the focus and intensity that characterized his momentous work for many years. The cooperation with Piasecki certainly proved to be most productive and inspiring. It seems that the old Masters still have got all that is needed to make great music and I wish the young Fusion and Prog players would listen to this album and use it as an example of what intelligent and honest music making is all about. Both contemporary Fusion and Prog seem to be completely lost these days, moving away from the glory that exemplified both idioms in the past. This album is a reminder what it was all about – great songwriting, virtuosic performances and above all personal integrity.